To commemorate the Rockman EXE series' 18th anniversary (today! ), our friends at The Rockman EXE Zone have translated a 2014 interview between character designer and art director Hayato Kaji and character designer Yuji Ishahara. This interview was originally conducted in honor of Rockman EXE 1's Wii U Virtual Console release. You can check out a select portion of it below! - I’d think giving everyone a Navi mark must be quite a bit of work, is that right? Ishihara: It actually just kind of works out (laugh). I design them all at once with the character’s image and the Navi’s colors in mind. So when the Navi is complete, the mark just ends up somehow being complete, too. The simpler it is, the cleaner it fits in. It’s not that difficult at all, it’s fun, actually. Kaji: Because emblems exist, you can relate to characters through them. Children are especially happy to have that sort of thing. Ishihara: However, it’s always been unclear whether they’re supposed to be something like a family crest, an individual’s mark, or a Navi’s unique mark (laughs). Hinoken has the same mark for all of his Navis, but Meijin has a different one every time, for example. 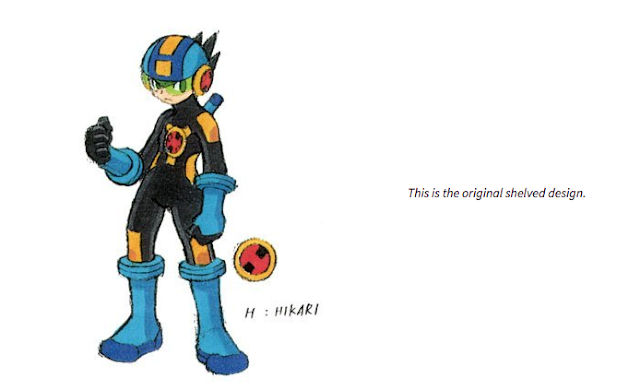 Kaji: Rockman alone has the “H” from “Hikari Lab” in his design. At first, it was just a normal cross, but a different designer put in one more line and made it cooler. Check out the full interview at The Rockman EXE Zone! Huh! I never took away an H from EXE's symbol. Neat. Yes, Bass' having a slash through it instead of the forte musical symbol and Match using the same one every time gave their use depth. That depth is where I got attached to it. The interview's actually a more interesting read than I thought it'd be, they talk about incorporating designs from Classic robot masters into their EXE Navi counterparts too.